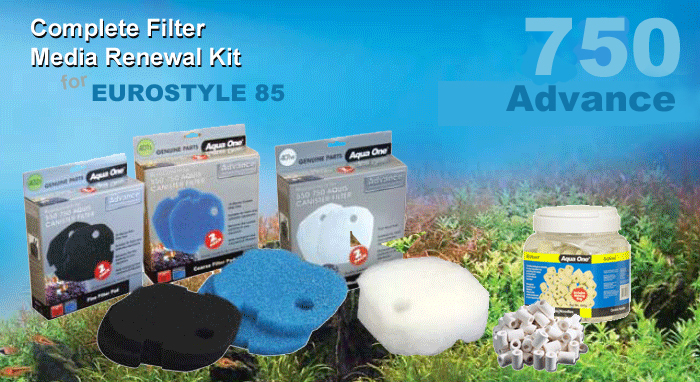 Maintain your EuroStyle Corner 85 aquarium in perfect condition with a full range of spares from Aqua One. We have all Advance 750 filter media, lighting tubes, heaters, food, decor and much more... No one cares more about your aquarium than Aqua One and Aquarium Parts. The EuroStyle Corner 85 uses Aqua One's very capable Advance 750 Canister Filter which means that maintanence is both easy and reasonably infrequent. We recommend changing the wool pads once a month, rinsing the filter foams im a little aquarium water at the same time and exchanging these every 6 months as they deteriorate over this period.